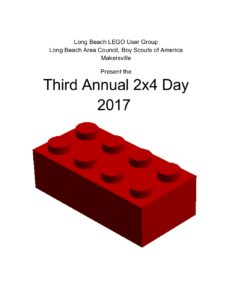 2×4 Day is a “Fan Created Global Day of LEGO® Brick Play”. Started in 2015, 2×4 Day is celebrated by simply playing with LEGO® bricks. There is much to say about 2×4 Day, but today I would like to share with you about the 2×4 Day 2017 Booklet. The Booklet is laid out as a Quest, and has puzzles and tasks for the player to follow. It provides questions, the Book of Answers provides the answers. The booklet was given as part of a package of activities and there was much LEGO® around. The booklet is available for purchase at the cost of $5. for a digital download. It is intended to be a guide for those who might want to frame their celebration in a similar fashion. All funds will be used for building LEGO® brick communities, because I seem to be doing a lot of that, and have some special projects in mind. Purchase it at the Squigglemom Store.